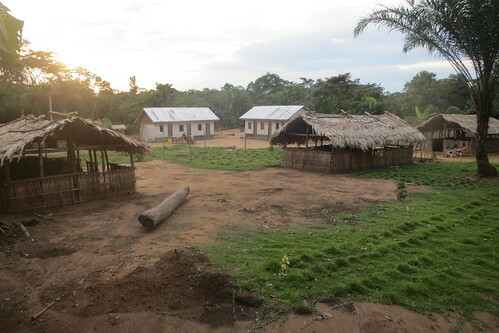 Our big dugout on the Lomami with a little fishing dugout alongside. Even when the outboards are working well, the logistics of moving up and down the Lomami are always “best case scenario”. Papa Bolenga our northern helmsman thinks in liters –depth –kilometers. He measures time in minutes (“we docked at 22h17min”). But despite a love of precision he is a “bricoleur” (handyman for worst of circumstances) and travels with a diverse tool kit including bits of old truck inner tube, metal sheeting, tin cans etc . Matthieu, Dino and I left Papa Bolenga in Opala on the 27th of February. 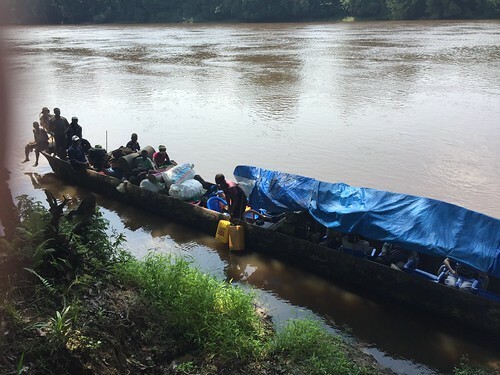 He was loading the big dugout with fufu, rice, beans, machetes, shovels, medical supplies…but mainly he had to wait for the fuel barrels to be downloaded from a barge to reload them in the dugout. 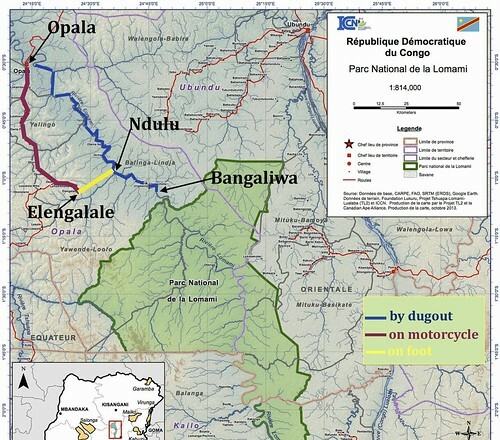 Matthieu, Dino and I needed to work with teams at our inland Elengalale base (see map) including outreach and surveillance. We took motorcylces the 95 km to the end of the road. Map of the buffer zone north of the park and our two northern base camps. 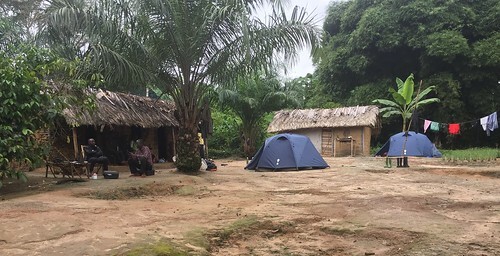 Three days later, after checking by Delorme that Bolenga had ready taken off, we walked the 24 km path from Elengalale to the Lomami River. We would meet Bolenga that afternoon. He would be pushing the dugout upstream with both 25horsepower and 15horsepower motors. He left at 3AM; we left a bit after 7 AM; we expected that we would all arrive at the mouth of the Ndulu (105 km Opala-Ndulu by river) about the same time. 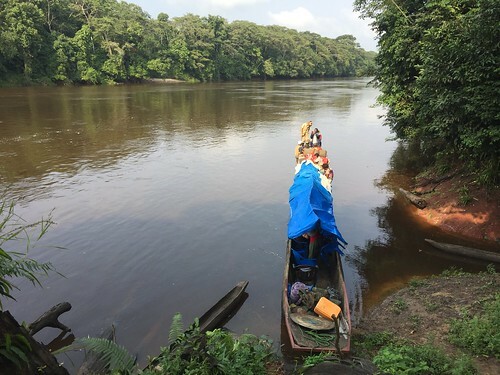 The Lomami River is up; last time I walked the Ndulu path I came right out on the Lomami. This time the backwaters and lagoons were flooded a couple hundred meters back. We called and pounded tree trunks thinking the big dugout was there. Finally a little fishing dugout came and picked us up. 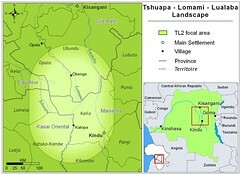 We took turns two by two crossing the Lomami to a small hunting camp on the higher east bank. Friendly fisherman took us through the backwaters and across the Lomami to the higher eastern bank. Eventaully we got a Delorme message: “The 25 hp broke down one hour out of Opala.” They were progressing with the 15 hp. Our tents set up at the Ndulu camp. We went to bed in the rain expecting the boat to arrive any minute. Not having eaten since the morning before, we were hungry when we got up. Fisherman helped us with some smoked fish and the wife of the hunter helped us with some plantains. The dugout arrived at 12 noon. Dugout landed at Ndulu hunting camp. Not only were they pushing a loaded 57.5 foot dugout against floodwater; they also had a second dugout tied on to accommodate extra goods and people. They only stopped once at 17hrs, to slaughter and cook a goat. Three hours later they were back in the dugout and continued all night. The whole time Bolenga had the motor disassembled on the floor of the dugout, with bits and pieces in caps, broken cups etc. The driveshaft had broken near the gearbox. The pinion, forward and reverse gears all need replacement. We bought this outboard in 2011, but Bolenga had on board another 25hp that we bought in 2007, already definitively broken down but kept for parts. Unfortunately it had had a driveshaft “repair” as well. He pounded and coaxed bits and pieces into an obedient structure. One half hour out of Ndulu the 25hp was back on the stern and churning along. It kept us going all the way to two km outside of Bangaliwa, and then gave up (Ndulu-Bangalwa 45Km). We got into Bangaliwa just at dark. 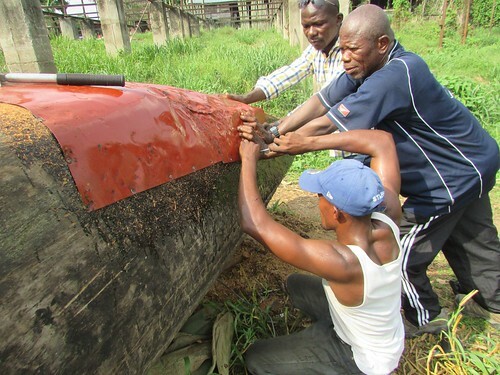 Papa Bolenga overseeing a major dugout repair in Kisangani. Upshot: When Matthieu, Dino and I returned 3 days later to walk back to Elengalale camp, the big dugout with the 15hp motor brought us down with the second smaller dugout again attached and the defeated 25hp lying in the bottom. The big dugout dropped us off at Ndulu and turned around. Dugout and 15hp are needed to keep the patrols going out. The small pirogue with paddlers coming around the Opala bend. 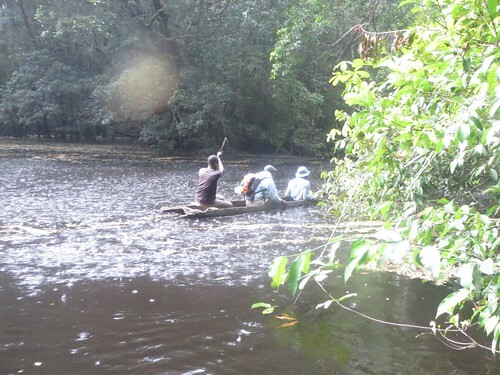 Bolenga unhitched the little pirogue and continued downstream with two paddlers. They stopped for 45 minutes to cook up some fish and foufou that they then ate in the boat. Whereas pushing upriver from Opala to Ndulu had taken 30 hours on the water with the 15hp and the big dugout. Going downriver in the little dugout from Ndulu with only two paddlers who did more steering than paddling took only slightly over 13hours. 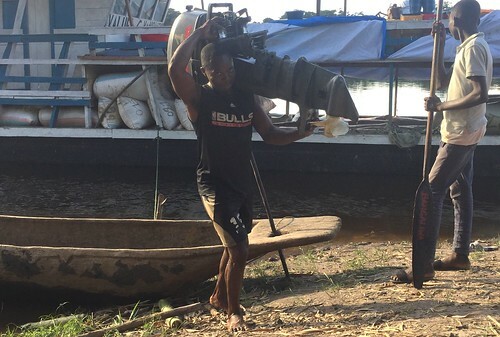 One of the muscular rice-loading stevedores stepped in to unload our 25hp outboard in Opala. Papa Bolenga is now in Kisangani collecting a whole portfolio of spare parts. And, much to his delight…a new 25 hp Yamaha outboard motor. 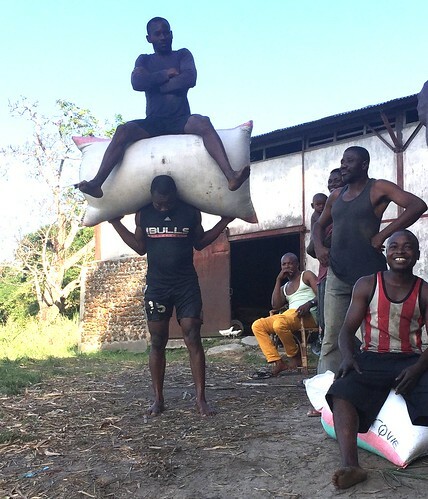 Demonstration of strength by a rice-loading stevedore. That sack of rice, alone, weighs 75 kg. This is rice season and the barges from Opala to Kisangani are all loaded with rice. This entry was written by Terese Hart, posted on 2018-03-15 at 9:43 pm, filed under Lomami River. Bookmark the permalink. Follow any comments here with the RSS feed for this post. Trackbacks are closed, but you can post a comment. Sounds like a hell of a trip Terese, glad to hear things worked out in the end. Great to have guys like Papa Bolenga on the team to depend on when problems arise.